After you’ve created your streaming content, you’re now tasked with getting it in front of as many viewers as possible. The problem is that far too many content creators stop at just creating content and don’t follow through with a strategy to make it easier for the content to be searched and viewed. Have you ever picked up a cable or satellite remote and clicked the “Guide” button? If so, then you’re familiar with a programming guide. The interfaces from cable and satellite providers are typically extremely slow and cumbersome. A huge complaint among traditional TV subscribers is that their programming guides are not interactive and are far too slow. At TikiLIVE, we saw this problem as an opportunity to offer a unique solution to our users. Our Program Guide is SUPER FAST and takes an entirely different approach than that of the other IPTV suppliers and traditional cable and satellite providers. At TikiLIVE, our Program Guide offers a whole host of features that simply can’t be matched by traditional TV providers. TV-like Experience – While we may operate much differently than a traditional TV or cable provider, we wanted to offer an interactive Program Guide format that did not seem foreign to viewers. 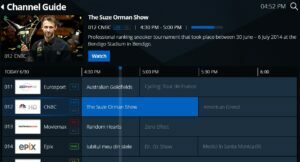 Our Guide offers a slick user interface where viewers can quickly navigate between channels regardless of their device. Full HTML5 Support – One huge benefit of using a provider like TikiLIVE is the fact that our content is available across all sorts of devices, including mobile phones, tablets, set top boxes, televisions and more. That’s why it was important that our guide supported a variety of devices. Device Cross-Syncing – Another benefit of TikiLIVE’s Guide is the ability to sync your programming schedule across all types of devices. Operators can easily make a change to their programming from the TikiLIVE middleware. It will then propagate to all devices, ensuring your viewers have your updated lineup, regardless of how they’re viewing your content. Robust Infrastructure – With TikiLIVE, all of your content lives in the cloud on our high-powered servers while being streamed across the Level3 CDN. This eliminates any concern about latency or buffering that you may have experienced with other streaming providers worldwide. Ready to Learn More about TikiLIVE’s Updated Program Guide? If you’re interested in learning more about TikiLIVE’s new TV-like SUPER FAST Guide, don’t hesitate to contact our support team at 305-743-6722. If you would like to check out a live view of our EPG, click here.